There are two dinner menus our kids love more than anything. Pizza night and taco night and I kind of have to agree that they are two of our favorites as well. 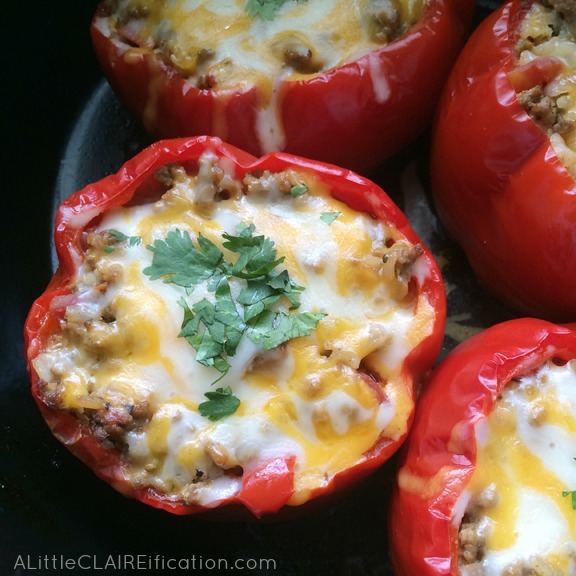 It’s me, Claire, from A Little CLAIREification and sometimes Mr. Claire and I like to take “taco night” up a notch – or ten – with these delicious Slow Cooker Beef Taco Stuffed Peppers. Fortunately two of our three boys love red peppers too so this is (almost) a complete win over here. We just save a little of the filling and make Littlest a soft taco or two. We figure he’ll come around someday and, if he doesn’t… well, there’s more for the rest of us. You could use which ever bell pepper you prefer. I personally am not a fan of the green (ok, I realllly dislike them in a strong fashion) so we use red, yellow or orange. Mostly red. This recipe takes only about 10-15 minutes prep – I’ve gotten it down to a science – and then into the slow cooker they go. Ground beef should always be browned and cooked before going into the slow cooker. While the beef is cooking make the rice – “minute” white rice takes 5 minutes to cook and brown rice takes 10 in the microwave. Remember – it’s going to cook more in the slow cooker so don’t worry. 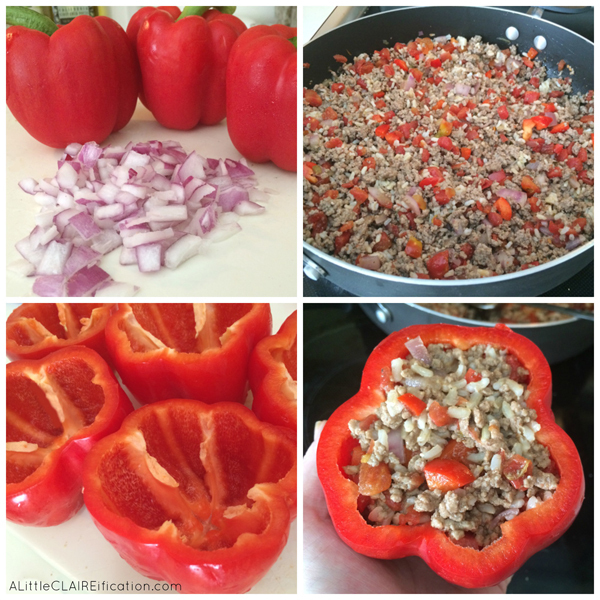 While the rice is cooking and I am stirring the beef, I prep the peppers for stuffing. Sometimes I make the beef and rice stuffing the night before and refrigerate it in a sealed container but usually I am just not that prepared so 10 minutes or so prep isn’t too bad. Served with a small salad and/or some black beans on the side, these stuffed peppers make for a fabulous Mexican inspired meal that is actually pretty healthy too, depending on the type of ground beef and rice you use. 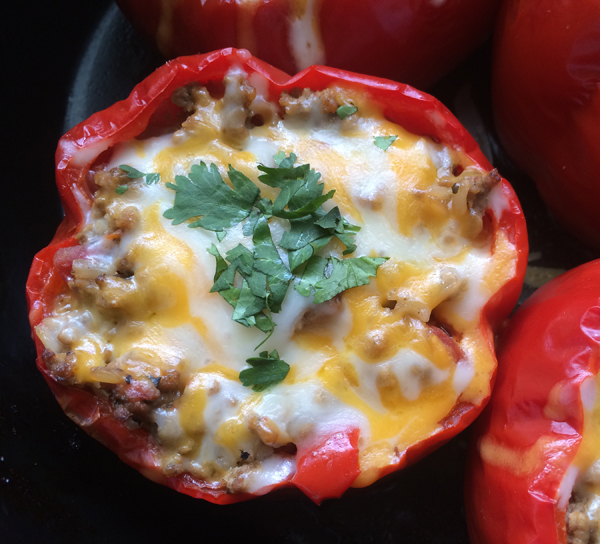 Hope you have a chance to try these – you can download and print the recipe below. 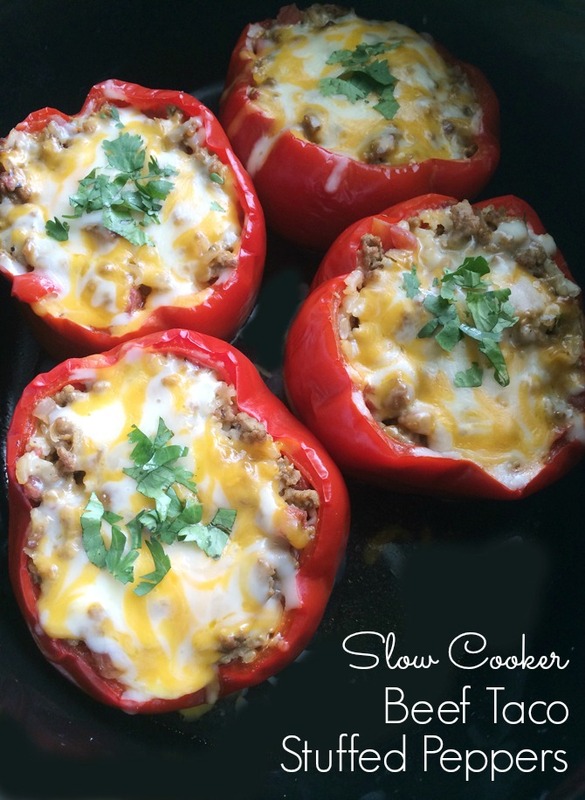 I always love hearing your comments so make sure to tell me all about it and I’ll be back with another delicious slow cooker recipe next month! Chop the tops off of the peppers (about 1 inch from the top) and set the peppers aside. Dice the red part of 2 of the pepper tops, discarding the other 2 tops, and set aside. Add the ground beef to the skillet, adding the onions and diced peppers after about 4 minutes. Cook the minute rice according to package directions while the beef browns. Once the beef is browned, add the cumin, garlic powder, diced tomatoes and beef broth and allow to simmer for a couple of minutes then remove from the heat. In the meanwhile, remove the seeds from the red peppers. Transfer the beef mixture to a large mixing bowl and stir in the cooked rice, the beaten egg and ½ cup shredded cheese. 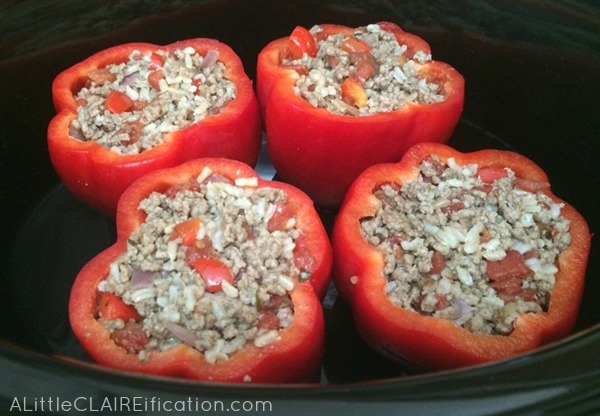 Turn the slow cooker on HIGH (or LOW if preferred – see below)and add 1/4 cup water. Using a spoon, stuff the peppers with the beef mixture and place them upright into the slow cooker. Cover and cook on HIGH for 3 hours or LOW for 5-6 hours. Just before serving, carefully remove the cover and top each pepper with the remaining shredded cheese. Cover for 2-3 minutes until melted. Serve warm with side dishes of choice. – The Shabby Creek Cottage <Loved it! This really looks tempting. I know my family will love it. Awesome Dorothy, give it a try! !